It is better than [Old Porch, Evesham]. 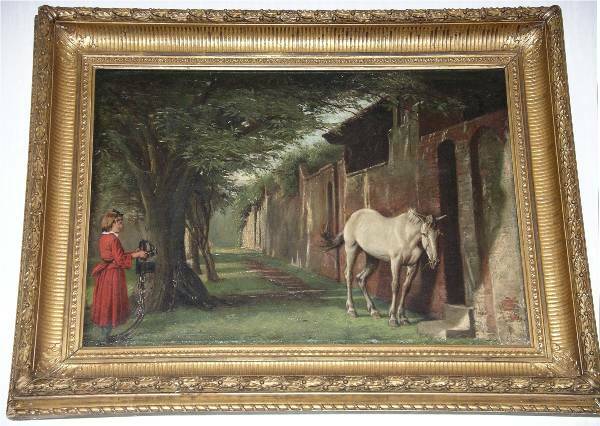 An old nag is a sly nag (427) shows a vista of trees and a sunlit garden wall; against the latter an old gaunt white pony rubs his shoulder while he looks askant at a halter held out by a little girl to coax him to work. The character and expressions are given with cleverness and spirit, and there is a touch of humour in the action of the pony, which lets one see that he knows he will have to give in and go to work. Though a little opaque the painting here is unusually clear and bright.